Project Animal Farm By Sonia Faruqi. Even when you know that there’s mistreatment among dairy and animal farms, as I do, this remains a shocking and detailed expose into the disheartening and mostly cruel world of food production. 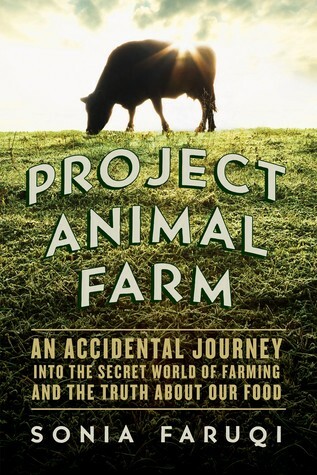 I dare any meat eater to read this book and not think about the farm to table process. Author Sonia Faruqi worked on Wall Street after graduating from Dartmouth College. When the market plummeted and she lost her job, she decided it might be interesting to volunteer on a farm for a bit. A vegetarian, Faruqi visited a dairy farm, a pig farm, a chicken farm, an organic farm, a pastoral farm and a slaughter house in Canada. She then traveled to Indonesia, Malaysia, Dubai, Singapore and Belize and then Vermont [primary agricultural state in New England] and California [second in the nation in animal agriculture behind Texas]. Both Vermont and California have no AG GAG laws—laws which prohibit undercover investigations on the conditions of industrial agriculture operations) to visit farms and factory farms there. One question I have is why we are crueler to animals than Europeans. Why does Europe have many more sensible and humane protections for animals and farms? Americans love their cats and dogs but it’s completely different when it comes to how that hamburger or chicken breast arrived at the grocery store. Most choose not to think about it or to just think that the way it’s always been done is fine. If you don’t care about the animals maybe you care about your carbon footprint: “a single factory farm can generate as much waste as an entire city.” While Project Animal Farm commands the reader’s attention through its well-written prose, conversational style and thorough research, it’s so disturbing at times I had to leave it for a bit. The United States remains one of the worst offenders in humane treatment and protection of animals in the food industry. — 9 out of 10 sows in the United States and Canada spend their lives in crates. –the veal industry is a by-product of the dairy industry. If you support the dairy industry you support the disgusting practice of “raising” veal. Male calves aren’t wanted by the dairy industry and are sold to veal farmers. –eight and a half billion chickens, 239 million turkeys, 112 million pigs, 32 million cattle and 2 million sheep and lambs were killed for human consumption in the United States and Canada in 2013. “It is impossible not to view the raising and butchering of animals for food as wasteful and hopelessly inefficient.” Approximately 50% of an animal is actually consumed. –in Malaysia [population 30 million] there are 500 KFCs, 300 Pizza Huts and 300 McDonalds. Malaysians eat more fast food than Americans. 1/3 of Americans eat fast food once a week while 3/5 of Malaysians eat fast food once a week. –Mexico [population 122 million] has 240 Walmarts, 150 Sam’s Clubs, 30 Costco, 500 Dominos, 380 McDonalds, 300 KFCs and 180 Pizza Huts. Sonia Faruqi will be reading and answering questions about Project Animal Farm at the Capitol Theatre in Arlington on Saturday, July 25, 2015 at 6pm. FTC Disclosure: I received this book for review from Pegasus Books. This entry was posted on July 25, 2015, 01:50 and is filed under Books, vegan/ vegetarian. You can follow any responses to this entry through RSS 2.0. Both comments and pings are currently closed.